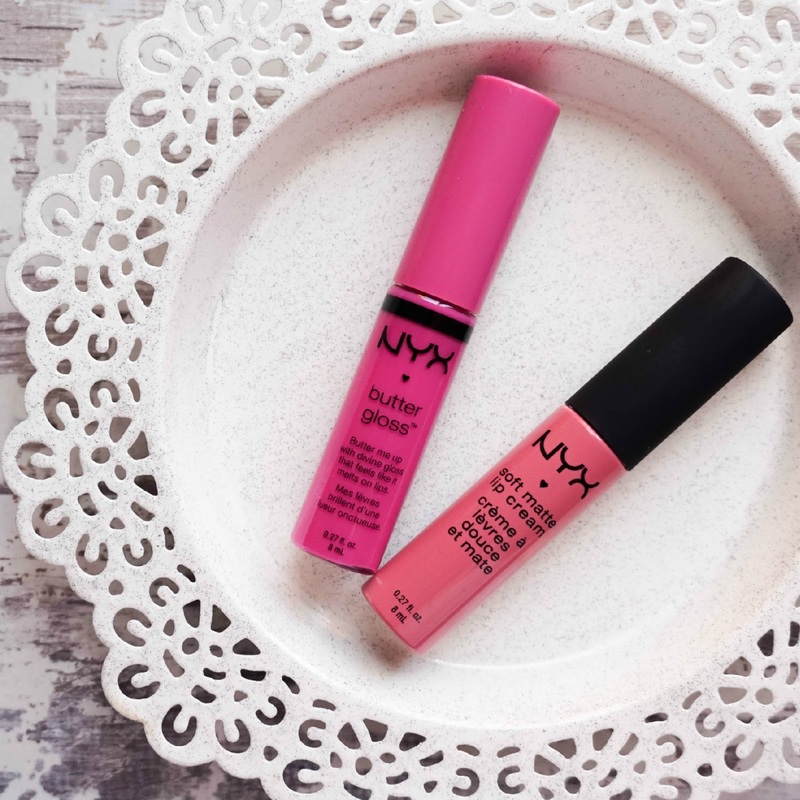 I can't express how happy I am to have finally got my hands on a few NYX products in particular two of their much hyped about lip products. Anyone from the UK will know that this brand is impossible to find in stores here but I finally forgot about any chances of swatching and just bought them off Amazon for a relatively good price (you can also get them off NYX website but the shades I wanted were out of stock and you do have to pay shipping). So after all this time of reading countless reviews on these two particular products and researching all the shades… have they lived up to the hype? Yup they definitely have, way more then I had expected and I simply love these lip products. There's a long list of other makeup bits & pieces that I want to try from the brand but for now I decided to stick with these two as my first taste. As you can see I went for safe shades with tones of pink in both gloss and matte version, as I had never swatched them in person and wanted to make sure I was going to get something that I would like to wear on an everyday basis. 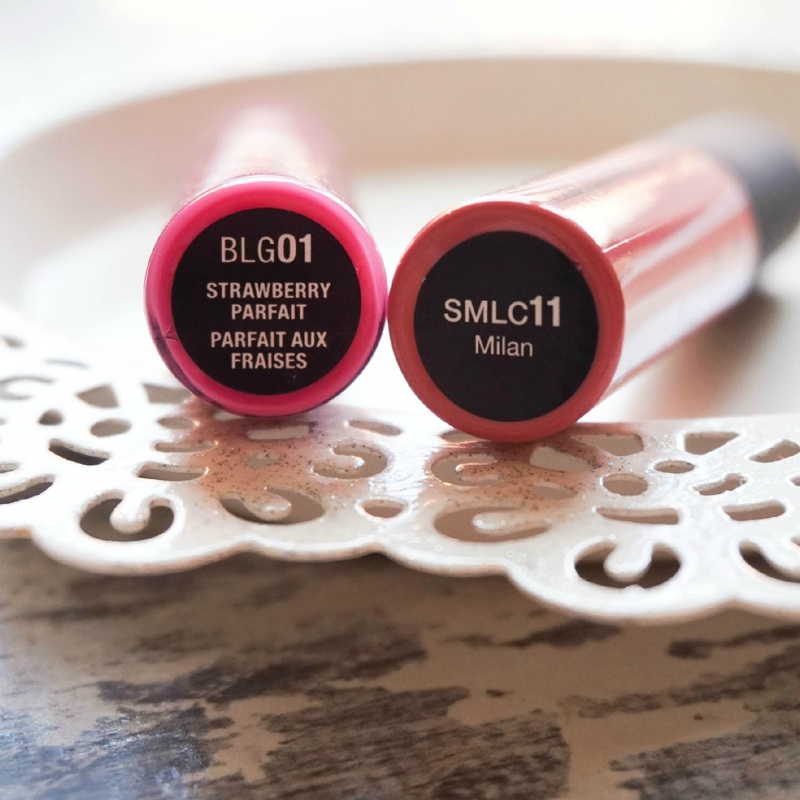 From the Butter Gloss range I picked out Strawberry Parfait and from the Soft Matte Lip Cream range I settled on Milan. Both options are my kind of pink toned colours and I know I will get a lot of use out of them over the next couple of months as they are perfect for spring/summer. First up the popular Butter Gloss, which I have been eyeing up for the longest time ever and probably researched every shade in detailed swatches. When it came to choosing a shade for myself I did struggle a bit as I wanted an every day shade but with a hint of colour. Strawberry Parfait does just that for me personally and it is a dream to wear. The scent of this is right up my street, gorgeously sweet but not overpowering enough for it to linger around all day. The best thing for me about this gloss is that it actually feels like butter, I know sounds strange but it doesn't have the consistency of any other gloss I have tried before. Instead it feels luxuriously moisturising, managing to leave your lips with a buttery soft & creamy finish, no sticky business going on here. It lasts for a few hours before it starts to fade which is understandable for a gloss and it keep my lips hydrated throughout the day. I honestly rate it as the best lipgloss I have tried so far, such a shame I can't find these in store anywhere as I would probably collect them all. 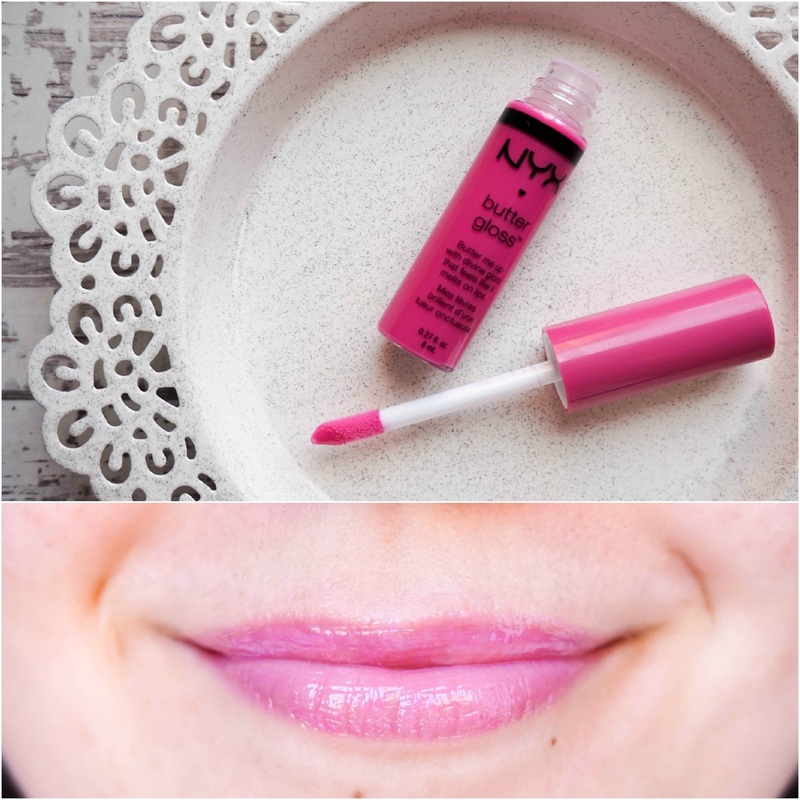 Next up is the relatively new Soft Matte Lip Cream in Milan which is a more vibrant pink shade without being neon like. I only came across this range recently so I'm not too sure just how 'new' they are on the market but for me personally they are a new and much welcomed discovery. The sweet scent is again present and I love it, but it's worth noting if you're not a scent lover. I am again taken completely by surprise as I just don't understand how this lip product can feel so creamy & soft yet look matte at the same time. 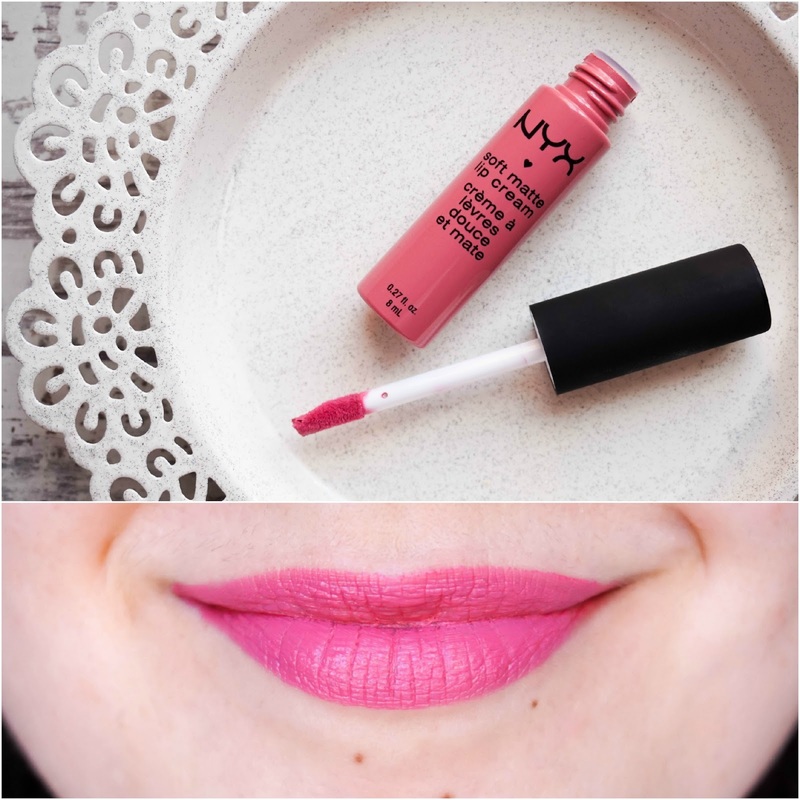 Whatever it is, NYX are on to another winner and I will definitely be looking to get more shades in the future. These actually take a few minutes to completely set on the lips so best off not to rub your lips together as I have in the photo above to avoid creating a ring-around-the-mouth look. There's a good part about the fact that they take a little while to dry though, because you are then able to build up the colour to your preferred intensity. Once they are set, they last a good 6 hours before signs of fading start appearing which is amazing for the price.